Argentina has a plan for building a small satellite launcher. The project is being managed by the CONAE (Comision Nacional de Actividades Espaciales), which integrates the work of many scientific institutes and universities in the country. The plan recalls the Condor ballistic system which was being developed by the Argentine Armed Forces. Argentina was forced to scrap the project in 1993. Fourteen years after having de-activated the Condor-II missile program, Argentina is again experimenting with rockets. Argentina’s Space Activities National Commission is in charge of the project which has had significant support from the Kirchner administration. Is it me, or does the launch pad in that launch diagram (last attached image) look a LOT like KSC's LC-39? Aug. 19 (EIRNS)—Argentina plans to develop a rocket launcher that will be able to place its domestically built small satellites into low Earth orbit, the head of the Argentine National Commission for Space Activities (CONAE) announced Aug. 15. Conrado Varotto said Argentina could launch satellites for one quarter the cost of buying foreign launch services, and that the technology would all be developed domestically. According to CONAE, the Tronador II ("thundering") rocket will build on Argentina's current Tronador I project, which uses a liquid-fueled engine, weighs about 60 kg, and can travel on an unguided ballistic trajectory up to 20 km. Tronador II, which will be about 10 times heavier, will use multiple engines, and add navigation, guidance, and control technology, so that the rocket can be deployed to a specific point in space. Varotto stated that satellites weighing between 250-400 kg could be launched with the new rocket, which he said could be ready for its first flight test in 2013, if the resources are provided. The small satellites would be a "dynamic cluster," he explained, each one designed for a specific mission, to test a particular technical capability. In this way, a failure in one does not jeopardize all of them, and allows for an "immediate response." Using conventional technology, he said, it can take up to six years to design, build, and launch a satellite. It will be quite interesting to see how the Tronador II will preform against Brazil's VLS-1 V4 . Not even close. We'll be lucky if it flies a 100kg demo to LEO in five years. The Army's Orbit has higher chances. Argentina has two orbital LV projects. One is the hypergolic project form the civil space agency, CONAE, commonly known as the TRONADOR Project, or more correctly ISCUL (Inyector Satelital de Cargas Utiles y Livianas, or Satellite Injector of Useful and Light Payloads) if you can read Spanish I would recommend this thread. Since it's made by a civil agency, and after the Condor II issues, they are very paranoic not to have anything to do with military applications. They went as far as not accepting anybody who had any experience from the Condor. Which is a shame since it had an immature GNC mostly develop. They have a small budget, and the they spent quite a long time developing a 4tnf thrust pathfinding engine, they had to do with a range that's only good for polar orbits (the only available place for normal orbits didn't pass the environmental impact), but they actually flew the guidance computers on Brazilian sounding rockets. Apparently those problems are behind, but the project is too ambitious for the budget and the political instability and economic realities will make it very difficult to actually launch an orbital flight. They did launched two TRONADOR rockets, but were mostly pathfinders and less than a good sounding rocket. The second project is from the Ministry of Defense, it has a project to develop a "big" solid rocket engine family. The original project was called GRADICOM. Once the single stage GRADICOM was successfully demonstrated, the two stages GRADICOM II was developed. You can read about it in my post. But basically it was a 1ton rocket with dual HTPB solid cores, with no thrust vectoring nor active surfaces, but it demonstrated successfully staging, and telemetry. The next version will be called Orbit, and will have active control. With any luck, it will launch next year. According to my calculations, if they use four cores as a first stage, they will reach orbital heights (400km), I don't think they will reach orbital speeds, but will probably demonstrate their GNC. They do have the experience from the Condor, and they want to use the single engine version for an artillery piece upto 400km, and with a multiple stage version (I calculate at least four) that could put small satellites on LEO. If you can read Spanish you can find more in this thread. Regarding the Orbit, the current schedule is to be publicly announced on October (election month), and a possible launch in November. The Orbit 2 is in the executive project stage. All this according to Grupo Leiva (I believe their site is http://rhleiva.com.ar/), the engine manufacturers. 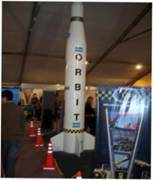 The Gradicom and Orbit were shown in EPSAM 2011, but, regrettably, I couldn't attend. This is the manufacturer of the engines. This is the best picture I could find around. So apparently they will have a single first stage (I expected a four as first stage and one of the same as second). What I can't see is any nozzle, nor active surfaces. So it seems more like a tactical missile than anything else. But the picture is very bad, I'll see what can I get. I've been told that the width at the base is 560mm. The GRADICOM II was 320mm. Acording to this article. 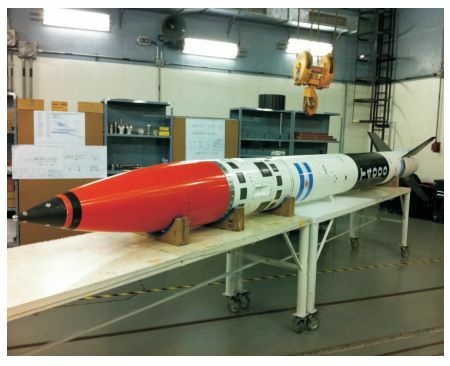 The rocket will be assembled in the Punta India Base, by the National University of La Plata, by the middle of 2012. The idea is to launch by 2013 from the Belgrano Naval Base (since they have the necessary infrastructure). They've leased a hangar from the Ministry of Defense, to do the initial system testings. they are working on the structural parts, and will receive, test, accept and integrate the engines and electronics from the other developers. The rocket is expected to have a height of 34m and put a 200kg payload in a circular 600km polar orbit. Argentina Plans First Domestic Satellite Launch. This thread is specific to, and only for, Tronador II. It shouldn't require an explanation. First picture of the Tronador T4000 pathfinder rocket. According the the Instituto Universitario Aeronáutico's newsletter, in the last page they explain their participation in the project. The T4000 engine is a 4000kgf rocket engine. Objective: testing of the telemetry and ground support team. Result: 13km apogee and 21km downrange according to the GNC. Launch Site: Barreira do Inferno Launch Center. Objective: Flight validation of the GNC (gyroscope, accelerometer, positioning and a cold-gas attitude system that utilizes a solar sensor). Result: 140km of apoggee. Payload made a parachute reentry and was successfully recovered from the sea. Launch Site: Puerto Belgrano Navy Base? Objective: Test GNC and validate engine technology? Now I'm getting lost! After the Orbit project (a 560mm wide solid engine), now they are talking about the suborbital FAS 1500, now specifically from the Argentinian Air Force (FAA). - Onboard Sensor for measure and registry of flight parameters. - Payload separation and recovering system. you can see a model. Ironically, they've named it "Fenix" or Phoenix in Spanish. May be some reference tho the Condor II program? In any case they seemed to be doing a very interesting approach. From rumors, it seems that this is a low risk approach to a 4+1 engines two stages solid LV. At the same time, they are working on the bigger Orbit. If both projects are successful, then they will combine them in a 4+1 LV, but with the 560mm engines of the Orbit. The Applied Research Center of IUA is apparently working on "plasma" and "hybrid" engines for nano and micro satellites. I guess with "plasma" they mean ion thrusters for station keeping, and "hybrid" are deorbiting engines. BTW, could a mod change the Thread's title to "Argentina's Launch Vehicle development" or something like that? Let me add another picture of the FAS 1500 and a note of the Tronador II. Both Gradicom/Orbit and FAS 1500 are HTPB solid rocket. But, apparently, the FAS 1500 uses 280mm engines taken from the Sonda I sounding rocket and the fuselage from the Castor sounding rocket. More news about the T4000! Pictures taken 25th of Nov 2011. They are stating that it will fly by December this year. I love that they do have a sense of humor. Rumors on the forums are that yesterday they tried to launch the T4000, and they couldn't ignite it. They also told me that it lacks a turbopump, so it's probably pressure fed. At the same time, the picture appears to show an ablative nozzle. Ok, this was worse than I imagined. Apparently, the T4000 didn't had a purge. So after the launch failure, they had to "safe it" with a MAG. Yes, they shoot the tanks with a MAG from an helicopter! Apparently they shoot 50 shots, 15 were on target. This way they emptied the tanks. I don't know what to say. Please someone tell me this is SOP. I always thought you could purge an hypergolic rocket. Or is there any particular problem of doing such a thing? This reminds me, that one of the US Viking sounding rockets in the 1950ies failed to lift of and had also been shot to relief the tank pressure and to prevent the vehicle from bursting. The Viking was saved by being shot and was later patched and conducted an successful flight.